With Wycombe Wanderers topping the table, largely down to the magnificent away form, the home faithful were due a performance from the Chairboys and they got one. Due to the vagaries of the fixture list, Saturday home games have felt like a rare occurrence so far this season which cannot have helped Wycombe at home so far. Going into the game against Southend, the Chairboys had failed to win in the last three games at Adams Park and more importantly not really performed to their best either. The loanees not being allowed to play in the FA Cup tie against AFC Wimbledon was a blow as it meant that Josh Scowen had to cover the right back position and be sacrificed from central midfield. Danny Bulman ran the show in the middle but it was still a very tight game. Against Burton Albion in the league, Aaron Pierre was most certainly missed too. So, with no new loan, injury or suspension concerns, Gareth Ainsworth was able to contend with the best sort of selection headaches against a resurgent Southend United. With admirable bravery, the Wycombe manager plumped for an offensive 4-1-2-3 formation which was a joy to watch during the first half. Despite getting caught cold at the start by a clinical goal from the impressive Jack Payne, the Chairboys kept their heads and deservedly went into the break 2-1 up after goals from Cowan-Hall and McClure. The formation offers fluidity going forwards which is proving difficult for opponents to defend against as players are popping up all over the place. It requires a high level of fitness and discipline from the whole team and the role of Josh Scowen in front of the back four is pivotal to the system for me. So far this season, Scowen has been excellent and considering the start of his first team career coincided with the beginning of Ainsworth’s reign, it’s wonderful to see him at the heart of Wycombe Wanderer’s resurgence. It’s very much a team game though and when Southend had a spell after half time, the defence stood firm. Phil Brown, sporting a wonderful matching flat hat and scarf combo, made a double substitution at the break which gave the Shrimpers a footing in the game. John-Joe O’Toole, a long term target of Brown’s, looked woefully short of match fitness in the first period and was correctly replaced by Gary Deegan in the middle with Myles Weston making way for Kevan Hurst out wide. Ten minutes of possession being dominated by the visitors followed but Matt Ingram only had to make one routine save from a Hurst free kick. Crystal Palace loanee Jerome Binnam-Wiliams, finally contributed something to the game on the hour mark, but unfortunately for him it was a mis timed tackle for which he was given a straight red card. Wycombe were clinical after this and deservedly added two more goals, a well struck Joe Jacobson free kick which Dan Bentley should probably have kept out and a tremendous strike from Matt McClure from twenty yards. It’s great to see young Matt back amongst the goals. Like I said on here the other week, goalscoring is a confidence game and hopefully this will be the start of purple patch for him. An excellent win but more importantly a tremendous performance from Wycombe Wanderers which will hopefully encourage a few more lapsed or potential fans to brave the cold at Adams Park on Boxing Day. Great report, and your commentaries are great for someone exiled in Northumberland. Cheers Paul. Thanks for listening/reading! Cheers Steve. It’s a lot easier to commentate on WW this season so far. 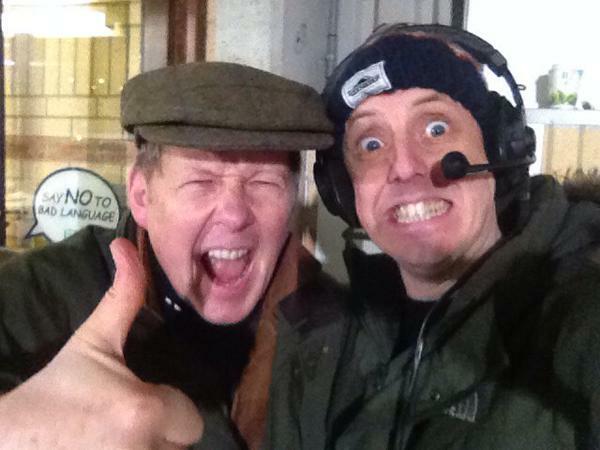 Phil, always great listening to the Saturday commentary….Blues lifeline for me and my son out here in East Anglia when we can’t make the games…..never forget your live link from the terraces at Torquay…all eyes were on you not the game! My son still says it was one of the best days of his life….have to agree, although Wimbledon cup replay in 2001 was pure theatre just like survival day last year. Keep up the great work and keep believing! Many thanks. All eyes were on your outfit that day, tremendous stuff! Wimbledon in the FA Cup was a brilliant night out but felt like an adventure whereas Torquay was next level!